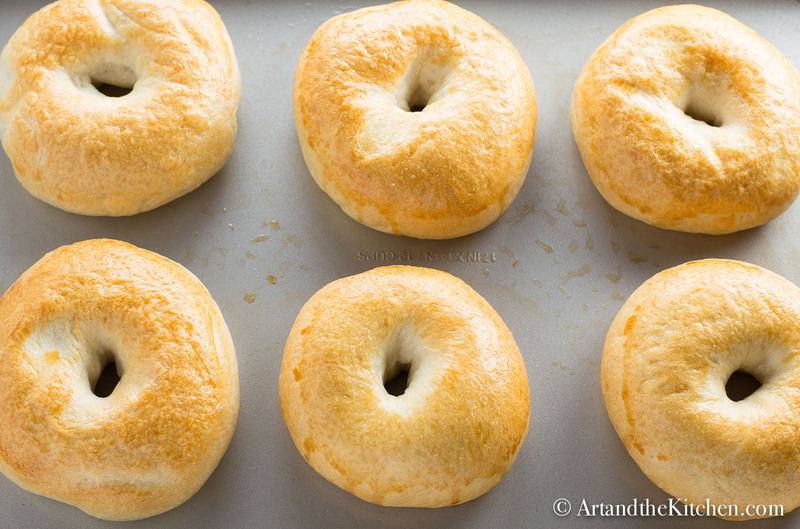 Time to pull out that bread machine and make delicious homemade Bread Machine Bagels. Do you have a bread machine that you haven’t used in a while? Its time to dig it out and make some homemade bagels. Amazing when they are warm and fresh from the oven with a pat of butter. Using your bread machine makes easy work to create bagels that are soft and chewy at the same time. The bread machine is so convenient and it is surprisingly easy to to use in making the perfect bagel dough. Some more great recipes using your bread machine are Bread Machine Pretzels or Bread Machine Donuts. Making fresh homemade bagels is so easy using a bread machine. Place all ingredients in order listed into bread machine pan. Insert baking pan securely into baking unit, close lid. Select dough setting on breadmaker, push start button. When cycle is complete, remove dough from pan and transfer to lightly floured surface. Divide dough into 10 -12 equal portions. Roll into balls, then using thumbs make a hole in the center of each ball, working dough until hole is about 1 inch. 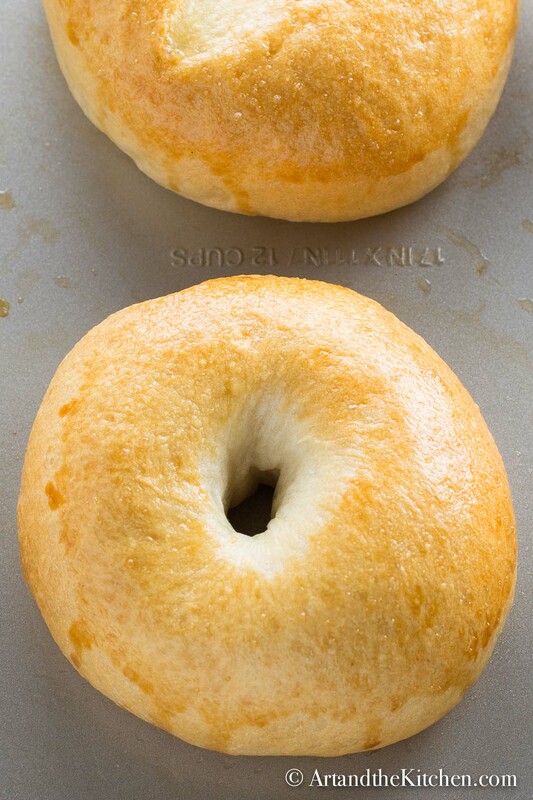 Grease top of each bagel with soft butter. Cover with wax paper and dry towel, let rise for 30 minutes. Simmer 1-2 minutes per side. Drain on paper towel, then, place on greased baking sheet. Brush lightly with egg wash. Prepare egg wash by whisking together 1egg and 1 tbsp. water. Bake 400º F for 25 to 30 minutes until golden brown. This sounds amazing! I’m just very partial to onion bagels probably because of my half-Jewish side. How do I make this recipe into an onion bagel recipe? Hi, I would just pan fry some chopped onions until they are translucent and then top the bagels with them before baking. So excited to try these bagels. I have seen so many recipes and I would much rather let the bread machine do the work. I can’t wait to try these. Might even try to do cinnamon raisin too. YUMMM!! Totally trying these 🙂 Thanks for sharing! Alison, the bread machine makes it so easy! Cinnamon raisin, YUM! Can you use all purpose flour for this recipe? I have used all purpose flour and it seems to work just fine. Have you tried making a gluten free version for the bread machine? No I haven’t, but I’m sure it works just great. Instead of putting them on a greased pan, can you use a silicone baking mat? Or would that not work? Hi there, what size bread machine is this for? I have the smaller 1 to 1-1/2 machine. Hi Alaina, this recipe is for a regular size bread maker. Do you have a recipe for pretzel bagels in a bread machine? Hi Debbie, I do have a recipe and I will try to get it posted to my blog soon. You said use the dough setting . my machine also has a bagel dough setting. Which do you mean? I used daugb is that ok? If your machine has a bagel dough setting that is what I would use. Thank you but to late I followed your steps. They taste good but a little harder than I was hoping. I baked at 400 and they were done in less than 20 min. I think maybe lower temp with longer time. I an guess here. I’ve tried many times to make a good bagel but yetthey usually turn out bready. Can you help me? Also When is best time to add cranberries, raisins etc. in the dough before baking? Hi Teresa, did you try this recipe? 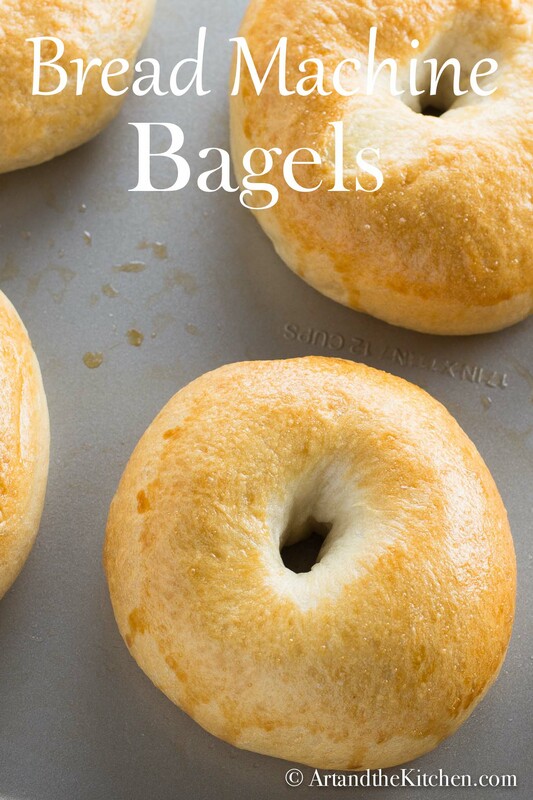 I don’t really have another bagel recipe I’ve made. Also the cranberries or raisins would go into the bread machine with all the other ingredients. Mine taste great but they didn’t raise. Any suggestions yeast was good,waited till machine turned off,covered with wax paper and towel. Hi Larry, boy thats a tough one to figure out, usually it is a problem with the yeast. 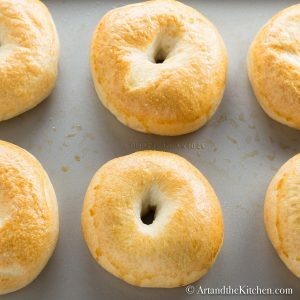 Did you remove dough as soon as dough cycle was complete and form the bagels, top with soften butter, then cover to raise? Another thing that can sometimes cause dough not to rise is room where dough is rising is too cool. Sorry I’m not able to help you more. Set your oven to the lowest temp and shut off when ready. Add a shallow ovensafe dish with warm water to the bottom and then place bagels to rise. Might have to watch more closely or leave the door cracked but that could solve rising problems. My house is drafty. Baked for 20 mins exactly as written and they were perfect! How would I adjust the time for mini bagels? Perhaps half the regular size? Thanks for the great recipe! Hey Natalie, the only thing that would change is the baking time may be slightly less. Hi Valerie, I think I would just use a whole wheat bread maker recipe for the dough, making the bagel should stay the same as this recipe. Hi Judy, I’m sure adding about a 1 1/2 tsp of cinnamon and about a cup of raisins to the recipe should work. Is the egg wash necessary or is there an a vegan alternative? Hi Tricia, the egg wash is not necessary, but the bagels will not have the shiny more crusty top. When I take mine out of the hot water I dip one side in corn meal and place on cooling rack. Then a sprinkle over a combination of poppy seeds, sesame seeds and dried onion flakes which stick well on the hot wet dough. I have also made choc chip which I knead into slightly cooled dough fresh out of the bread maker. I bake on a corn meal covered oven stone. This is a fantastic recipe. Thanks for those great tips Sheila! Wow, can’t wait to try this! I have to drive a long way to the bagel shop and when I get there, often they are sold out of the plain bagels (my favorite). Just dug the old bread machine out of the basement. Have to go buy some yeast. Thanks. Hey Gary, a great reason to pull out the old bread maker! Enjoy. I’ve made these twice now, they never look very good (my fault) but they taste amazing. I usually make plain, parmigiana and everything. Thank you Shay, it does take a bit of practice making into pretzels shapes. Turned out great! They were so easy to make thanks for the amazing recipe!